Studio time is expensive and all too often we end up making creative decisions based on that expense and often the end product suffers. The home studio offers you the freedom to experiment with innovative ideas and work at the pace that is right for you. 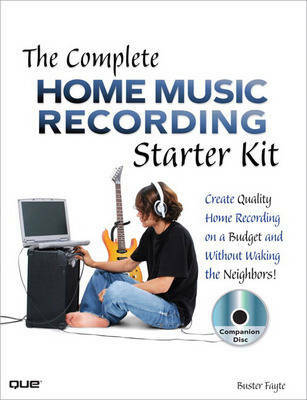 This book gets musicians set up and recording as quickly and as inexpensively as possible. It will excite and energize musicians who are struggling to find a way to document their creativity through music. This complete starter kit includes a DVD with software from Sony and other major music manufacturers. It also includes training videos, royalty-free audio loop files, downloadable sound files and much more! Buster Fayte gives you tried and true steps to creating the best environment for home music production, offers create techniques and skills he's learned in his 25+ years of music production at home, and as a trainer for Sony - the creators of Acid Pro and Sound Forge.